The tweet said: "Our lionesses go back to being mothers, partners and daughters today, but they have taken on another title - heroes." 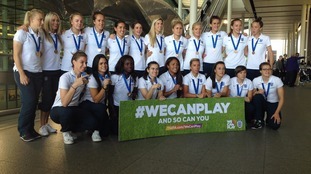 The England Women's World Cup team has arrived back in Heathrow after pulling off the best finish by any England team at a World Cup since the men were victorious in 1966. Fara Williams' extra-time penalty against Germany in Edmonton handed the Lionesses a 1-0 win that secured them a bronze medal in the tournament. An unfortunate own goal by Laura Bassett in stoppage time against Japan pushed the team out of the semi-finals. But that was all but forgotten when the team arrived home jubilantly on Monday morning. England can now confidently target Euro 2017 glory at the tournament in Holland. The qualifiers begin in September. The United States won the Women's World Cup thrashing Japan 5-2. America not only captured a title that has eluded them for 16 years but also avenged their 2011 final defeat against the same opponents. What a win for Team USA! Great game @carlilloyd! Your country is so proud of all of you. Come visit the White House with the World Cup soon. The mother of England's Laura Bassett has told ITV News her daughter will bounce back from scoring the decisive own goal in the semi-final. Sports stars and fans rallied round Laura Bassett after her own goal sent England crashing out of the Women's World Cup. The sister of England footballer Jill Scott has said she "couldn't be prouder" of what the team has achieved during the Women's World Cup. Amanda Wilson told Good Morning Britain she was yet to speak to Jill after last night's defeat but said the team had been "brilliant to watch" during the tournament. England lost 2-1 to Japan after an own goal in the semi-final in Canada last night. Ms Wilson told GMB: "I always remember Jill kicking a football. Probably around 7 she played on the boy's team up to about 11. All the boys absolutely loved her and they all wanted Jill on their team - she used to run rings around them." Midfielder Kartie Chapman's husband and three sons, will be nervously watching the semi-final against Japan back in England.